When asked what brought them to Pahrump, Gretchen Loken didn’t hesitate when she answered, “We came because of the winery.” Gretchen and her husband Bill are co-owners of the Pahrump Valley Winery. They left Arizona where she was teaching special education classes to children with physical and mental challenges. Bill was in real estate at the time but had some restaurant experience in his past. 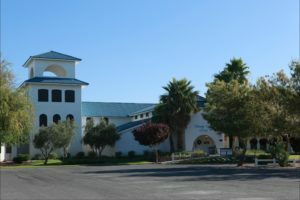 They decided to uproot and head out to Pahrump where Bill’s brother’s company, Western Horizon Resorts, had just purchased the winery and adjacent land to establish an RV resort. Western Horizon was more interested in developing the resort and didn’t know what to do with the winery. So, Gretchen and Bill came out to manage it for them. The winery opened originally in 1990, and by the time the Lokens got here in 2003, it was starting to show its age. It needed some investment of both money and TLC. They took on the project with the intent to revamp it and eventually purchase it. One thing you must realize is that neither of them knew anything about wine, nor did they drink it very much. But they liked the idea of the adventure so set out to learn something new and become wine masters. Gretchen’s motto is, “You don’t know what you don’t know.” In 2005, they bought the business outright and produced the first Nevada state red wine made from Nevada grown and processed grapes. When they first came in 2003, they started on a renovation project beginning with the restaurant. 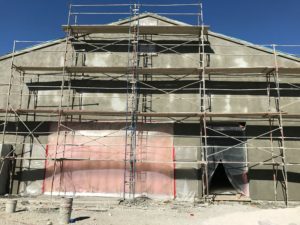 Over the next few years, they also began working on the grounds followed by the winery production area, tasting room, and then the restaurant expansion. When they first began managing the winery, there was no actual production of wine on the property. There were no barrels, no wine produced from the grapes on the acreage, and no equipment. Where Do They Get Their Grapes? They began adding more grapevines on the estate while also obtaining access to two acres in Crystal, NV. In 2010, they started harvesting grapes from a five-acre vineyard in Amargosa. In 2016, they developed five acres of Symphony grapes (named after their five-star winery restaurant) also in Armargosa and they’ll be harvesting and processing them soon. In 2017, they added five more acres for mixed red wines bringing their total acreage of vineyards in Armargosa to 15 acres. They also work with generational farmers in Dyer, NV (just across the border from Bishop, CA) and have been experimenting with their grapes to see which ones work best. As time goes by, they add new varieties allowing them to expand their ability to produce different Nevada harvested wines. They now have about eight acres of grapes planted in Dyer including Chardonnay, Riesling, Sauvignon Blanc, and Malbec. What excites them most is going from zero wines produced with Nevada grapes when they started to 25% today. Over the next five years, they are estimating 75% of the grapes will be from Nevada and only 25% from California. Gretchen shared that because of the individual characteristics of the grapes, they will always need some California fruit. One third are people visiting Las Vegas who want a change of scenery for a day and to taste some award-winning wine. 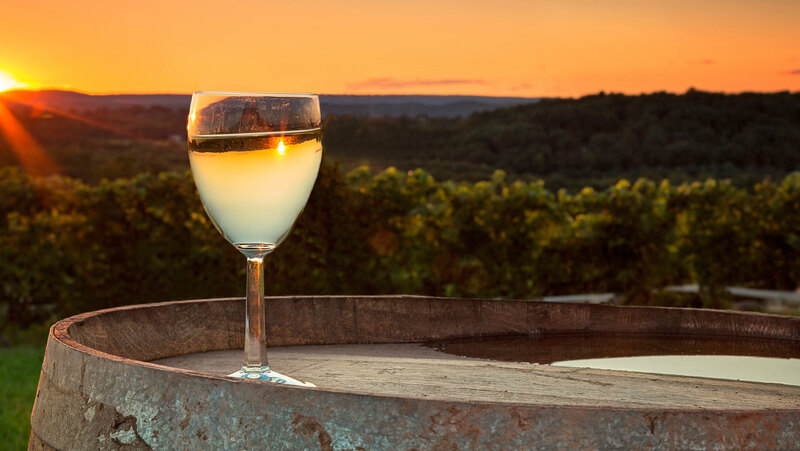 One third are Las Vegas residents who are entertaining out of town guests who bring them to the country for some wine tasting and a day away from the big city. The remaining third is a combination of Pahrump residents and visitors to Pahrump who come to participate in some of the other attractions such as Front Sight, Spring Mountain Racetrack, or Death Valley. Vineyards use one-tenth of the water that other crops, such as alfalfa, do which is one of the primary appeals for desert farmers. 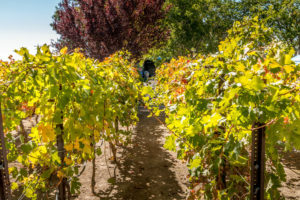 Grapes grown in Nevada must be shielded from the hot sun which is different from other regions who manipulate the leaves to expose the grapes. Harvesting usually starts earlier in the drier, hotter country. The buds begin appearing in March, and the harvesting usually starts the last week of July. With these steps completed, additional renovations are underway. The Lokens are expanding the production and storage area by four-fold. 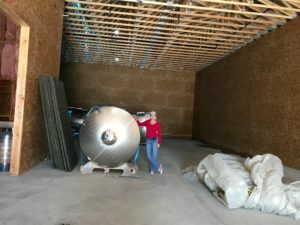 They have been producing 10,000 cases of wine per year, and after the remodeling project is complete, they’ll have the capability to produce 40,000 per year. Bill is the architect and designer of the expansion project. The majority of the new structure being added to the existing building is for storage and production. The capacity for storage will go from 150 barrels to 400. The designated production area will more than double, allowing them to keep up with the increased plantings of Nevada grapes. They hope to have the rough completion done by the end of the year 2017. The full completion will be in the spring of 2018. Future outdoor construction plans include a wedding pavilion, a bar-b-que and bar, and a remodeled stage suitable for music and entertainment. They also purchased another 10 acres contiguous with the current property. Plans for this land have not yet been finalized. They’ve developed relationships with Sundance Helicopters as well as Presidential and Earth Limousine companies to bring tourists up from Las Vegas. This winery has been voted Best Winery and Best Restaurant in rural Nevada by Nevada Magazine for 2015, 2016, and 2017. So far, they’ve won over 450 national awards since 2004. These awards are displayed in their den across from the tasting room. The Lokens invite you to come to Pahrump Valley Winery, take a tour, do some wine tasting, enjoy a glass in front of the fireplace in their den, and then make your way to the eloquent Symphony’s dining room for a five-star dinner.